The eyes are the most important organs through which we view the entire world. We need good eyesight to live our life in a good way. When we suffer from any eye problem, the routine activities will be hindered. We can say if the vision is lost almost everything is lost. Such a vision should be preserved and monitored regularly. Some of the vision problems arise congenitally, due to injury and aging. However, timely treatment is necessary to save our blessed vision. In this article, we pursue about cataract and its advanced surgical procedure. Formation of a clouding in the lens is called a Cataract. Lens work like a lens of a camera which is behind the iris, focusing light images on the retina that sends images to the brain. A Cataract makes the images blurred, dull and vision difficulty at the night time. There is no preventive care for cataract. The reasons for cataract would be eye injury, side effects of some medications. A statistic shows that 70% of the people with more than 75 years are affected by cataract. Cataract surgery is performed with many modern techniques. It is actually breaking the clouding into small pieces and replacing with the lens. The Lensx laser advanced bladeless cataract surgery treatment helps surgeons to customize the operating procedures based on the patient's’ eyes. Lensx laser emerged with international standard technology with integrated optical coherence tomography (OCT) that precisely captures high- resolution images of eyes. The data, measurement and the images are obtained with the help of OCT that aids doctors perform surgery to an exact specification rather than traditional surgery. Amrit Hospital offers best Bladeless Cataract Surgery in Chennai with the help of dedicated team of doctors and other staff. The doctor consultation, patient care, and surgical procedures are available at an affordable price. Our advanced technologies, modern equipment, sophisticated infrastructure forwards us in world class level. More than 100 Bladeless cataract surgeries are done within two months successfully. A type of refractive surgery using a laser to correct Myopia, Hyperopia, and Astigmatism can be termed as LASIK or more commonly as Laser Eye Surgery. The correction basically aims at reconfiguring cornea, to rebuild visual acuity by sharpening the retinal focus within the eye. The defect incepts when there is an error in refraction of light. It can be due to some anomalies in the shape of eyeball or cornea. Short for laser in-situ keratomilusis, the surgery is employed as a permanent alternative to eyeglasses or contact lenses. In recent years, tremendous advancement have been made in this field. A narrow, round shaped flap is created by some surgical tool. The cornea tissue beneath, visible after folding the flap, is removed at microscopic amounts by using an ultraviolet light beam coming off the highly specialised laser system. 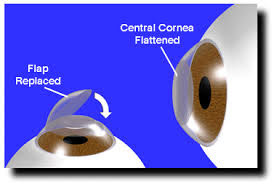 Cornea is either flattened or steepened according to the defect experienced by the patient. After this, the flap is carefully laid back to its position, which adheres gradually and healed. Adequate measures are taken to keep your eyes wide open like applying numbing drops to get the eyes in a relaxing posture. Also blinking of eyes is restricted by making use of a small device which holds eyelids tight. Further the excimer laser uses an eye tracking system which corrects the position of your eye for any delicate involuntary movements. Our Ophthalmologists here at Amrit have years of experience and are pioneers in the industry. We have devised the most modern WaveLight® EX500 Excimer Laser particularly for the primary LASIK Treatment and are routinely performed on an outpatient basis. To see the beautiful things in life and to enjoy our life better we need vision, most importantly clear vision. Compared to other parts of the body eyes are too delicate and need highly accurate and sophisticated techniques to treat. Cataract is a condition in which lens of the eyes gets clouded. Spreading slowly this can affect one or both the eye. It is estimated that cataract is the causes 33% blindness all over the world. Faded colours unclear vision, seeing halos around lights, difficulty with bright lights, reduced night vision are the major symptoms associated with cataract. The doctor will administer treatment based on the age, stage of the disease, body type, medications taken earlier for diseases like diabetes, B.P etc. LenSx laser uses technologies including integrated optical coherence tomography (OCT) to obtain highly clear and precise image of the affected eyes. Then the cornea is removed and artificial lens is placed. The major advantages of this procedure is fast recovery, less pain, reduced side effects and the result is permanent. Amrit Hospital offers Best Bladeless Cataract in Chennai. It emerged as one of the best eye hospital , which provide affordable Eye Treatments in India. A clear and perfect vision is what we want. It is through this two little windows we view world in its actual beauty. Does cloudy eyes deprive you of this joy? Amrit Hospital offers best minimally invasive Femtosecond cataract surgery in Chennai. Recently it is emerged as the Best Eye Hospital In Chennai, India. Lens of our eye works like a camera. It passes light to the retina, which sends light signals to brain enabling us to see properly. Mostly this condition occurs in old age. Our lens is comprised of water and protein. When we age its structure gets disoriented this protein will accumulates in the central part making it hazy. This condition is called cataract. If not treated at the right time it will lead to total blindness. In Cataract Surgery translucent lens is replaced it with an artificial one. It is estimated that around 20 million people are suffering from blindness due to cataract in the world.. Femto Lasik is newly developed ocular laser technology prescribed for correcting vision. Functioning using the principle of Photodisruption this laser is used to created flap in the cornea. After that cornea is recreated using excimer laser thus regaining the lost vision. Dr. Lalit Kumar famous eye surgeon provides best eye treatment in Chennai.The hospital have facilities such as 24 hour laboratory with auto-analyser, QBC machine, Imaging department with 300 KV motorized X-ray unit, Twin probe Ultrasound machine, 2 major Operation Theaters. This hospital has the credit for completing 100 bladeless surgery in 2 months. Eyes are vital organs that plays an important role in our health. Routine eye examination is important for children to ensure they are free from vision problems and is having proper visual acuity. Now a days 5 to 10 percent of preschoolers and 25 percent of school age children are facing vision problems. Early detection and treatment will help to secure your child’s future. Pediatric ophthalmology is a branch of ophthalmology dealing with eye diseases and vision care in children. Pediatric eye diseases are common in children. Pediatric strabismus or squint: It is the misalignment of eyes, where retinal image is not in corresponding areas of both eyes. Here one eye focus on a particular object, while the other eye turns inwards, outwards or downwards. Amblyopia or lazy eye: It is a vision development disorder, where visual acuity (sharpness of vision) cannot be achieved even after using eyeglasses or contact lenses. Only a single eye is usually affected by lazy eye. If it is left untreated, it can lead to serious visual disability. Congenital Cataract: Here clouding of lens occurs by birth. It is a rare eye disease where grey or white clouding is appeared on the pupil. Congenital Glaucoma: Childhood glaucoma is a birth defect that is caused by incorrect development of eye drainage system. Sensitivity to light, enlarged eyes, cloudiness are the common symptoms of childhood glaucoma. Congenital Lacrimal Drainage Block: Duct obstruction occurs in nearly 5% of the newborn babies. Here the lacrimal drainage system gets blocked. The main symptom of lacrimal block is increased tear lake or mucous discharge. Retinopathy of Prematurity (ROP): It is an eye disease that is commonly seen in premature babies. Here abnormal blood vessels are grown in retina, that lead to the detachment of retina from back of eye. This causes blindness among children. Most of the eye diseases of children can be managed by using eyeglasses or medications. If it does not show any results, then surgery is preferred. Lasik surgery, cataract eye surgery, Bladeless Lasik Surgery etc. are commonly used to treat cataract, glaucoma, lazy eye. 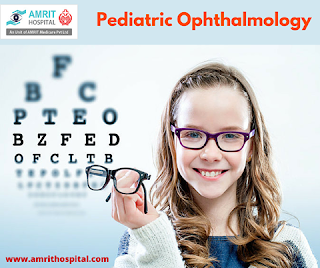 Amrit hospital is one of the best eye hospital in Chennai, providing advanced treatments in pediatric ophthalmology at an affordable cost. Are you tired of wearing glasses or contact lenses? Need freedom from glasses? Then don't wait it's time to let go of your spectacles and say yes to lasik. Here we have a new surgical procedure called Bladeless lasik surgery to help you. Lasik commonly called as laser eye surgery is a surgical procedure used to correct myopia (short-sightedness), hyperopia (long sightedness) and astigmatism( defect in the lens or eyes caused by deviation in spectral curvature). Here in lasik surgery the ophthalmologist uses microkeratome blade to create a circular flap and folds back the flap and removes some corneal tissues using excimer laser. Thus we can improve our vision clarity. But in bladeless lasik surgery the flap is cut using femtosecond laser. Studies have proven that lasik surgery is safe and efficient. Offers accurate flap creation and adjustable settings. Lasik surgery is performed under anesthesia to numb the eyes to create a comfortable environment for the surgery. Here a flap is created on cornea and is lifted back for proper light exposure. After reshaping the cornea the flap is repositioned to form a natural bandage. All procedures are done without pain and bandage and will be recovered within no time. After lasik : Slight irritation or blurred vision may be present for few days and will be cleared soon. Amrit Hospital Chennai provides a world class eye treatment, offering best medical and surgical care at affordable prices. The hospital contains a team of experienced and highly qualified eye specialists. 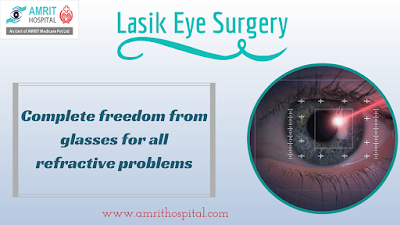 Enhance your beauty and get a new appearance without glasses from bladeless lasik surgery from Amrit Hospital.